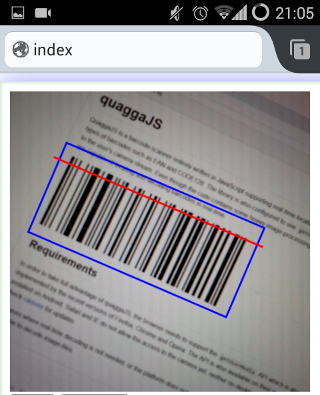 Try some examples and check out the blog post (How barcode-localization works in QuaggaJS) if you want to dive deeper into this topic. This is not yet another port of the great zxing library, but more of an extension to it. This implementation features a barcode locator which is capable of finding a barcode-like pattern in an image resulting in an estimated bounding box including the rotation. Simply speaking, this reader is invariant to scale and rotation, whereas other libraries require the barcode to be aligned with the viewport. QuaggaJS can be installed using npm, bower, or by including it with the script tag. Currently, the full functionality is only available through the browser. When using QuaggaJS within node, only file-based decoding is available. See the example for node_examples. You can simply include dist/quagga.min.js in your project and you are ready to go. The script exposes the library on the global namespace under Quagga. For starters, have a look at the examples to get an idea where to go from here. This npm script builds a non optimized version quagga.js and a minified version quagga.min.js and places both files in the dist folder. Additionally, a quagga.map source-map is placed alongside these files. This file is only valid for the non-uglified version quagga.js because the minified version is altered after compression and does not align with the map file any more. The code in the dist folder is only targeted to the browser and won’t work in node due to the dependency on the DOM. For the use in node, the build command also creates a quagga.js file in the lib folder. This method initializes the library for a given configuration config (see below) and invokes the callback(err) when Quagga has finished its bootstrapping phase. The initialization process also requests for camera access if real-time detection is configured. In case of an error, the err parameter is set and contains information about the cause. A potential cause may be the inputStream.type is set to LiveStream, but the browser does not support this API, or simply if the user denies the permission to use the camera. If you do not specify a target, QuaggaJS would look for an element that matches the CSS selector #interactive.viewport (for backwards compatibility). target can be a string (CSS selector matching one of your DOM node) or a DOM node. When the library is initialized, the start() method starts the video-stream and begins locating and decoding the images. If the decoder is currently running, after calling stop() the decoder does not process any more images. Additionally, if a camera-stream was requested upon initialization, this operation also disconnects the camera. This method registers a callback(data) function that is called for each frame after the processing is done. The data object contains detailed information about the success/failure of the operation. The output varies, depending whether the detection and/or decoding were successful or not. Registers a callback(data) function which is triggered whenever a barcode- pattern has been located and decoded successfully. The passed data object contains information about the decoding process including the detected code which can be obtained by calling data.codeResult.code. In contrast to the calls described above, this method does not rely on getUserMedia and operates on a single image instead. The provided callback is the same as in onDetected and contains the result data object. In case the onProcessed event is no longer relevant, offProcessed removes the given handler from the event-queue. In case the onDetected event is no longer relevant, offDetected removes the given handler from the event-queue. The callbacks passed into onProcessed, onDetected and decodeSingle receive a data object upon execution. The data object contains the following information. Depending on the success, some fields may be undefined or just empty. The configuration that ships with QuaggaJS covers the default use-cases and can be fine-tuned for specific requirements. QuaggaJS supports web-workers out of the box and runs with 4 workers in its default configuration. The number should align with the number of cores available in your targeted devices. In case you don’t know the number upfront, or if the variety of devices is too big, you can either use navigator.hardwareConcurrency (see here) where available or make use of core-estimator. 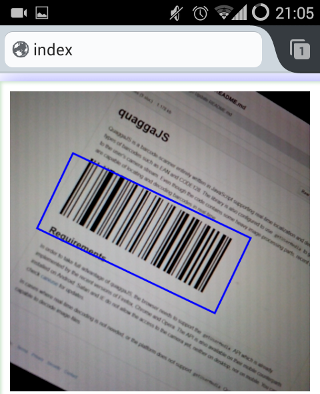 One of the main features of QuaggaJS is its ability to locate a barcode in a given image. The locate property controls whether this feature is turned on (default) or off. Why would someone turn this feature off? Localizing a barcode is a computationally expensive operation and might not work properly on some devices. Another reason would be the lack of auto-focus producing blurry images which makes the localization feature very unstable. However, even if none of the above apply, there is one more case where it might be useful to disable locate: If the orientation, and/or the approximate position of the barcode is known, or if you want to guide the user through a rectangular outline. This can increase performance and robustness at the same time. The inputStream property defines the sources of images/videos within QuaggaJS. First, the type property can be set to three different values: ImageStream, VideoStream, or LiveStream (default) and should be selected depending on the use-case. Most probably, the default value is sufficient. Thirdly, the area prop restricts the decoding area of the image. The values are given in percentage, similar to the CSS style property when using position: absolute. This area is also useful in cases the locate property is set to false, defining the rectangle for the user. The last key singleChannel is only relevant in cases someone wants to debug erroneous behavior of the decoder. If set to true the input image’s red color-channel is read instead of calculating the gray-scale values of the source’s RGB. This is useful in combination with the ResultCollector where the gray-scale representations of the wrongly identified images are saved. This top-level property controls the scan-frequency of the video-stream. It’s optional and defines the maximum number of scans per second. This renders useful for cases where the scan-session is long-running and resources such as CPU power are of concern. QuaggaJS usually runs in a two-stage manner (locate is set to true) where, after the barcode is located, the decoding process starts. Decoding is the process of converting the bars into its true meaning. Most of the configuration options within the decoder are for debugging/visualization purposes only. Why are not all types activated by default? Simply because one should explicitly define the set of barcodes for their use-case. More decoders means more possible clashes, or false-positives. One should take care of the order the readers are given, since some might return a value even though it is not the correct type (EAN-13 vs. UPC-A). The multiple property tells the decoder if it should continue decoding after finding a valid barcode. If multiple is set to true, the results will be returned as an array of result objects. Each object in the array will have a box, and may have a codeResult depending on the success of decoding the individual box. The remaining properties drawBoundingBox, showFrequency, drawScanline and showPattern are mostly of interest during debugging and visualization. Beware that the order of the supplements matters in such that the reader stops decoding when the first supplement was found. So if you are interested in EAN-2 and EAN-5 extensions, use the order depicted above. It’s important to mention that, if supplements are supplied, regular EAN-13 codes cannot be read any more with the same reader. If you want to read EAN-13 with and without extensions you have to add another ean_reader reader to the configuration. The locator config is only relevant if the locate flag is set to true. It controls the behavior of the localization-process and needs to be adjusted for each specific use-case. The default settings are simply a combination of values which worked best during development. Only two properties are relevant for the use in Quagga (halfSample and patchSize) whereas the rest is only needed for development and debugging. The halfSample flag tells the locator-process whether it should operate on an image scaled down (half width/height, quarter pixel-count ) or not. Turning halfSample on reduces the processing-time significantly and also helps finding a barcode pattern due to implicit smoothing. It should be turned off in cases where the barcode is really small and the full resolution is needed to find the position. It’s recommended to keep it turned on and use a higher resolution video-image if needed. The second property patchSize defines the density of the search-grid. The property accepts strings of the value x-small, small, medium, large and x-large. The patchSize is proportional to the size of the scanned barcodes. If you have really large barcodes which can be read close-up, then the use of large or x-large is recommended. In cases where the barcode is further away from the camera lens (lack of auto-focus, or small barcodes) then it’s advised to set the size to small or even x-small. For the latter it’s also recommended to crank up the resolution in order to find a barcode. The following example takes an image src as input and prints the result on the console. The decoder is configured to detect Code128 barcodes and enables the locating-mechanism for more robust results. The following example illustrates the use of QuaggaJS within a node environment. It’s almost identical to the browser version with the difference that node does not support web-workers out of the box. Therefore the config property numOfWorkers must be explicitly set to 0. A growing collection of tips & tricks to improve the various aspects of Quagga. Barcodes too far away from the camera, or a lens too close to the object result in poor recognition rates and Quagga might respond with a lot of false-positives. Starting in Chrome 59 you can now make use of capabilities and directly control the zoom of the camera. Head over to the web-cam demo and check out the Zoom feature. Dark environments usually result in noisy images and therefore mess with the recognition logic. Since Chrome 59 you can turn on/off the Torch of our device and vastly improve the quality of the images. Head over to the web-cam demo and check out the Torch feature. To find out more about this feature read on. Unit Tests can be run with Karma and written using Mocha, Chai and SinonJS. Coverage reports are automatically generated in the coverage/ folder. In case you want to take a deeper dive into the inner workings of Quagga, get to know the debugging capabilities of the current implementation. The various flags exposed through the config object give you the abilily to visualize almost every step in the processing. Because of the introduction of the web-workers, and their restriction not to have access to the DOM, the configuration must be explicitly set to config.numOfWorkers = 0 in order to work. Quagga is not perfect by any means and may produce false positives from time to time. In order to find out which images produced those false positives, the built-in ResultCollector will support you and me helping squashing bugs in the implementation. You can easily create a new ResultCollector by calling its create method with a configuration. After creating a ResultCollector you have to attach it to Quagga by calling Quagga.registerResultCollector(resultCollector). The frame property is an internal representation of the image and therefore only available in gray-scale. The dataURL representation allows easy saving/rendering of the image. Now, having the frames available on disk, you can load each single image by calling decodeSingle with the same configuration as used during recording . In order to reproduce the exact same result, you have to make sure to turn on the singleChannel flag in the configuration when using decodeSingle. Maintenance Connection Canada (Asset Pro Solutions Inc.
Added offProcessed and offDetected methods for detaching event- listeners from the event-queue. API Changes In the course of implementing web-workers some breaking changes were introduced to the API. Added Quagga.onProcessed(callback) which provides a way to get information for each image processed. The callback receives the same data object as Quagga.onDetected does. Depending on the success of the process the data object might not contain any resultCode and/or box properties.